What are the keys to the Sean Payton Offense? He uses short passes as an extension(or replacement) of the run game and as a way to get his playmakers the ball quickly in space. Constantly trying to find mismatches with sub packages and mismatched formations/playcall. Uses playaction and mismatches to boost the deep pass. (Somewhat surprisingly) run-heavy gameplan that is frequently changed to a pass by Brees at the LOS. Sean takes too much flack for abandoning the run, when Brees is often the one making those checks at the line. I'm guilty of this too, as one of the biggest Payton critics on the forum. If you watch how often our OL is run-blocking on a quick-hit pass, you'll see what I mean. 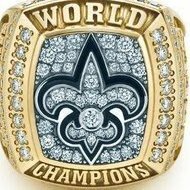 Check out Deuce Windham on YouTube, he breaks down all kinds of Saints tape and goes over a lot of their route concepts and scheme specific stuff. We don't deep pass much anymore. It used to be the dagger in the heart, but now it's more short/intermediate passes. I don't think Payton deserves all the criticism he gets for not running the ball, I just think we have been forced to pass an awful lot due to terrible defense. And some years we've been weak at RB. And lots of short passes and screens replacing some of the run game. But he absolutely does deserve the blame for consistently terrible defense. Everyone knows the phrase "The best offense is a bad defesne"
Until I see it done with someone else... The biggest key is having the most accurate passer in NFL history throwing passes in it.